You are being informed that, in accordance to articles 13 and 14 of the EU General Data Protection Regulation, the following personal information is saved and used only for the purpose of entering and maintaining a business relationship: salutation, title, surname and given name, contact information like postal address, position, phone and fax number, e-mail-address as well as bank details, if applicable. If you do not agree to this usage of your personal information, a business relationship is not possible. Responsible company for saving and usage of the personal information: certus Warensicherungs-Systeme GmbH, Am Bullhamm 39, 26441 Jever, registered at the district court of Oldenburg, register no. HRB131 129. Authorised to represent is managing director Dr. K. F. Harms. In case of out-sourcing of services, we declare that our partners will only receive the personal information that is absolutely necessary to fulfil their service duties. We hold our partners responsible for treating the personal information according to the EU General Data Protection Regulation. The personal information is not used for any other purposes, not even commercial, than those stated above. Provided personal information is not merged with other sources of data for any purposes, such as profiling. Your personal information is kept for the duration of the business relationship and, in accordance to §195 German Civil Code BGB, for a maximum of five years after that. This duration restarts with each new contract. Some information may have to be kept longer, as demanded by german tax and business law and will only be erased when permitted by those laws. This information will be protected from unauthorized access. 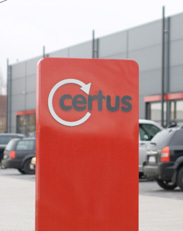 You can revoke your agreement to our usage of your personal information at any time by giving notice to: certus Warensicherungs-Systeme GmbH, Am Bullhamm 39, 26441 Jever, phone +49 4461 9230-30 or certus@certus-eas.de.